We all know that feeling – waiting at the red light for dozens of seconds, even minutes, wondering when it will turn green. That frustration leads to anger which can then ruin your whole day. But luckily, with new technology, Audi has implemented software in their 2017 Q7 and A4 models that have a countdown system for traffic lights. What a time to be alive. In association with the Regional Transportation Commission of Southern Nevada, Audi’s Traffic Light Information (TLI) is the first time vehicle-to-infrastructure (V2I) tech has been added to a road-ready vehicle, and it’s now available on the market. The availability behind the tech is the product of an involved partnership amongst Audi and Nevada. So how does it work? 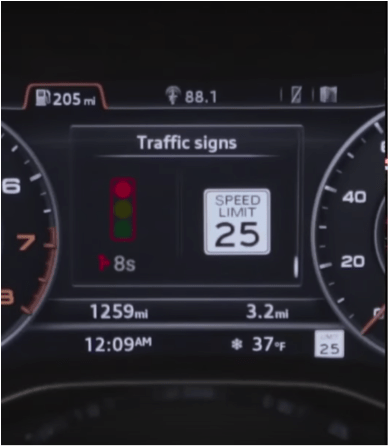 The TLI feature is in the vehicle as a countdown timer that is displayed in the Audi Virtual Cockpit. As the driver approaches a connected intersection with a red traffic light, the TLI icon and a countdown to green timer appear to let said driver know how long they have until it’s time to hit the accelerator. Using the 4G LTE connection for Audi Connect that’s already in the A4, Traffic Light Information utilizes real-time traffic light timing data pulled from the same traffic center that sets the timing of all of the traffic lights in the region and combines that with GPS data so the software can analyze exactly which traffic light the driver is approaching, determining whether that light is green or red. With this information, the driver can determine whether they need to stay alert or place their eyes on the infotainment system to change the radio or check a message. The timers disappear from the Virtual Cockpit at the four-second mark, which that notifies the driver to pay attention to the road. What’s quite interesting is that the vehicle also can calculate whether or not the driver can make it through an intersection based on the speed at which the car is traveling. The TLI counter appears if the light will be red when I arrive at the light. If the light is green, there will be no pop-up – impressive technology. This technology is surely changing the automotive industry. We should see more car manufacturers implementing this software in the coming years. As stated before, right now it’s currently only in the 2017 Audi Q7 and A4 models. Once this tech is standard in most vehicles, I believe drivers will be less anxious while waiting at the light – and that is for the best.